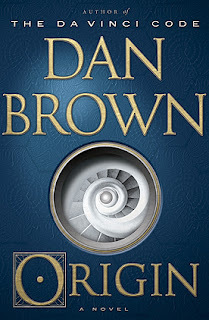 Recommended to: readers who enjoy Dan Brown's writing style and the Robert Langdon series. I have been a fan of Dan Brown since The Da Vinci Code and I have thoroughly enjoyed all of his books up until this one. This particular story was interesting in challenging our relationship with technology and perhaps opening a dialogue about our future as a species. The characters and story line just felt a little meh for me. Part of the charm of Dan Brown's stories are that they all take place in real places, and this is no exception. Focused in Spain our hero, Robert Langdon once again finds himself caught in the middle of an ordeal, this time focused on a former student of his. To say Langdon's character wasn't really necessary seems cruel, but that's how I felt. His particular expertise didn't shine through and his character could have been replaced with almost anyone with a similar academic background. His inclusion in the scandal felt forced at times and simply ridiculous at other times. Vidal was an interesting character and I enjoyed her contributions to the story. She really carried the story for me. A strong, intellectual, beautiful woman with ties to the throne, what could possibly be wrong with her? It was a remarkable commentary on her relationship with the Prince and how that all came together in the end. All in all I didn't love this particular installment of the series. I think fans of Dan Brown and his character Robert Langdon will find this interesting. The actual "discovery" is quite dramatic and very interesting and I would love to chat about it in real life, but alas the plot just didn't fit for me this time.